The Humanscale Diffrient World Chair White marks Humanscale's first foray into all-mesh task seating. Like its mesh-backed forerunner, Liberty, the Diffrient World chair's tri-panel backrest hugs the body to provide tailor made lumbar support, while its mesh seat eliminates contact stress under the thighs. 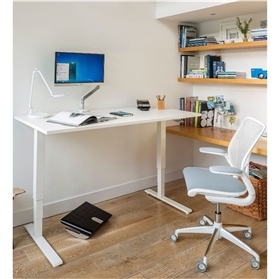 But Diffrient World's major innovation is its mechanism-free recline action, which leverages two parts of the chair's frame and the laws of physics to provide automatic, balanced support throughout the full range of recline. No chair is more intuitive, creating the ultimate user-friendly sitting experience. 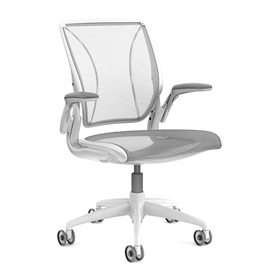 This special edition Humanscale Diffrient World Chair has white frame and base and white pinstripe mesh on the seat and back for a sleek modern design.